Finding the Best VPN for China is not always easy – here’s what you need to know to find a VPN service that works in China. Which are the best China VPN services and why? A number of reliable VPN providers cater to the Chinese market and have done for years. However, some China VPN providers have fared better than others dealing with the recent crackdown and improvements made to the Great Firewall of China (“GFoC”) aka the Golden Shield. You can see the extent of the GFoC’s censorship yourself at https://en.greatfire.org/analyzer (Chinese version). The VPNs recommended below work inside China at the time of writing. The second half of this article discusses the factors you should consider when choosing a VPN for China; immediately below, are our own recommendations when applying those criteria. Top Tip – Because things can change quickly in the China VPN landscape we recommend you do not sign up for a longer-term contract even though good discounts may be available. Despite the ongoing crackdown on VPN services, VyprVPN still works in China. In fact, VyprVPN is the most stable and fastest China VPN on the market today. In the latest rounds of China blocking VPNs, VyprVPN's engineers were able to get all major sites unblocked within 3.5 hours and all sites unblocked within 5 hours. Most other VPN providers are still struggling to restore their services in China. VyprVPN has been playing cat and mouse with the Chinese authorities for over 8 years and that experience shows. But don't just take our word for it. Greatfire.org agrees with us. They are a non-profit organization committed to helping Chinese users circumvent the Great Firewall of China and access websites blocked in China by monitoring and reporting on censored websites in China. VyprVPN is able to bypass the Great Firewall of China by using its very own proprietary VPN Protocol called Chameleon. The Chameleon protocol scrambles OpenVPN packet metadata to ensure it’s not recognizable by deep packet inspection (DPI) while retaining OpenVPN’s unmodified 256-bit data encryption. The result: a fast and lightweight VPN protocol that can bypass even the Great Firewall of China’s DPI methods. You can enjoy access to an open Internet now and see why VyprVPN is considered the best China VPN by Greatfire.org and Cogipas.com. 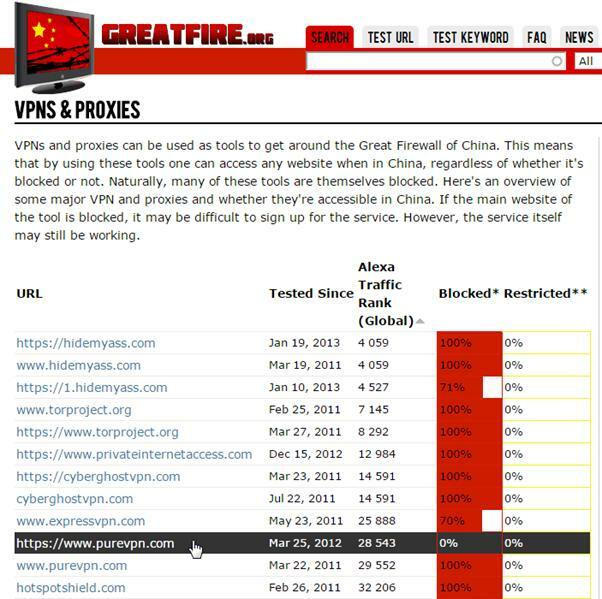 Remember, Greatfire is an independent non-profit organization and their tests clearly show that VyprVPN is the best VPN for China. Get it today! Our readers can enjoy an additional discount off VyprVPN’s already affordable prices. ExpressVPN features GFoC busting “stealth servers” located in Hong Kong which are specifically designed to evade China’s blocking efforts. ExpressVPN is admittedly expensive but also has the most generous “hassle free” money-back guarantee in the business at 30 days. ExpressVPN’s main website is blocked in China but their alternate site is not yet blocked in China. (If you are in China, clicking on the ExpressVPN link should automatically take you to their alternate website in China. PureVPN is based in Hong Kong, has been in business since 2007 and makes a pretty compelling case about their VPN in China – see https://www.purevpn.com/china-vpn-service.php. PureVPN has a 7-day money-back guarantee which is enough time to try if it’s right for you. At the time of writing, PureVPN’s secure website https:// is NOT blocked in China (see screenshot). 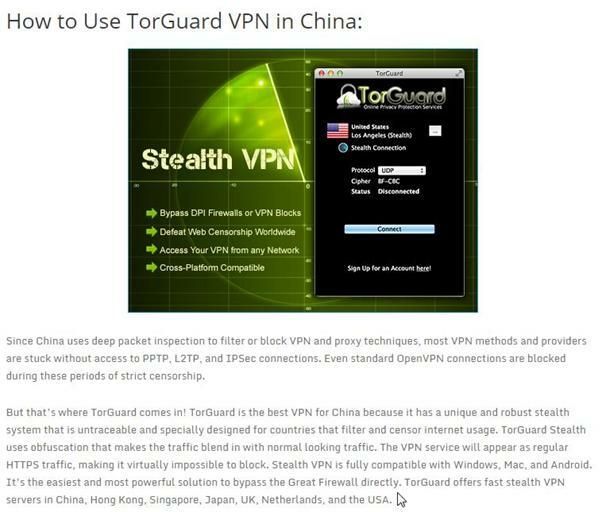 TorGuard VPN implements a version of the OpenVPN protocol that can evade the Great Firewall of China – for details see https://torguard.net/blog/the-best-vpn-for-china-torguard/. The TorGuard website is blocked on-and-off in China, so you mightbe able to sign up and download the necessary software even while in China. Make sure the VPN expressly caters to mainland Chinese users. If you don’t see claims that make this clear, keep looking. 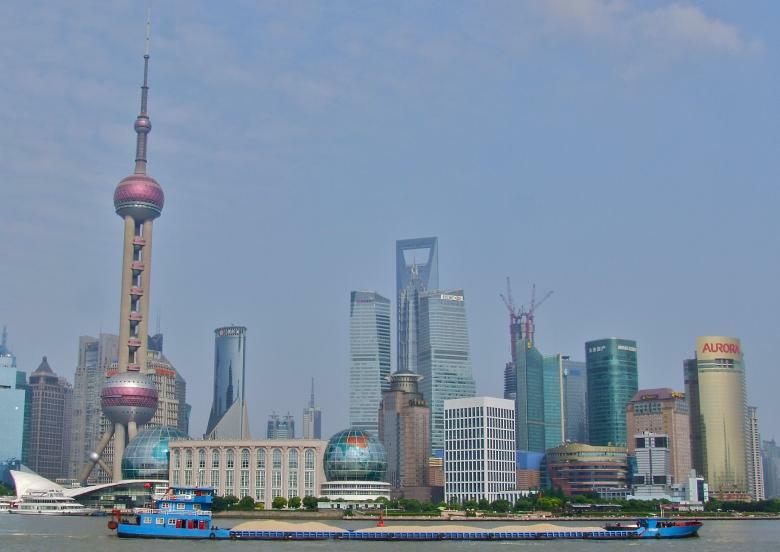 Different VPNs use their own terminology for technologies that can bypass the GFoC – stealth, cloak, obfuscation, etc – but the bottom line is that they will thwart the deep packet inspection utilized by the Chinese authorities. Top Tip – Although this post is oriented to China, the factors below and recommendations above are also relevant for users in places like Iran, the United Arab Emirates (UAE), Pakistan, Oman and countries in Central Asia. Be wary of anyone touting a free China VPN. We all love free, but it takes a significant investment of effort and technology to overcome China’s blocking apparatus. As a result, be distrustful and skeptical of free services. Take it as a good sign that you to have to pay for a fully functional China VPN as these providers have an incentive to keep their tools working and your online activities safe. VPN use is exploding in popularity in China and the VPN providers that “get it right” stand to gain considerably. In other words, better to stick with the premium VPN services above which are developed and maintained outside the influence of Chinese authorities. Look for a VPN with proxy servers located in Hong Kong, Taiwan, Japan, and West Coast USA (San Francisco/California) or West Coast Canada (Vancouver/British Columbia). This is important for having decent speeds and a good user experience when hooked up to the VPN. Ideally, the VPN’s website won’t be blocked in China. This really helps as it means you can access the VPN’s website directly to sign up, pay and download the necessary VPN software. Unfortunately, almost all VPN websites are blocked in China – for the very latest on which VPNs are blocked visit https://en.greatfire.org/vpns-proxies (Chinese version). If the VPN you are interested in is blocked in China, try using Tor Browser or sign up the next time you are travelling abroad. If Tor browser is blocked from your location in China, try it with the obfsproxy plugin (now included and part of the official Tor Browser packages). You could also try the Japan-based, volunteer VPN network VPN gate (Chinese version). Other times, it may even be possible to contact the VPN provider by email to complete some of the signup steps. Also choose a VPN with a money-back guarantee. No matter how much research you do, ultimately you simply have to select one and try it out. If, for whatever reason the VPN does not work for you (see ‘warning’ below), ask for a refund: no harm done. Although not essential, consider as a bonus when a VPN supports features such as a VPN kill switch and DNS leak protection. Top Tip – On that note, when trying out the VPN, don’t immediately access controversial websites! Go slow and progressively visit sites that are increasingly likely to be censored. If (but only if) your activities warrant a heightened level of protection (for example, a dissident), consider running your VPN over Tor or running one VPN overtop another (“double VPN”). We need to end on a note of warning. We are not claiming any method here will achieve 100% success; no one can claim that and if they do run the other way. The GFoC is a multi-headed monster and an unpredictable one. Methods that work today may not work tomorrow. Even more frustrating is that a method may work in one part of China but may not work in a different part of the country owing to the GFoC’s inconsistent implementation. Whether you live in China or will soon visit, you will need a VPN if you want to enjoy the websites and online access that many of us take for granted. We won’t lie: finding the right China-friendly VPN for your needs will take a little extra work. But the result is well worth the effort. Increasingly, VPN providers are trying to crack the Great Firewall of China. This can only benefit Chinese VPN consumers in the years to come. Good luck! / 祝你好运！/ Zhù nǐ hǎo yùn!